February 17 – date: Senior Educational Advisor, Al Mutatawera Services Holding Company, Kuwait.Al Mutatawera is a shareholding company involved in the provision of educational services. The company identifies, creates, implements and supports opportunities in the fields of education, training, research and offset development. My role involves exploration of regional educational business opportunities. The Australian College of Kuwait, Kuwait. The Australian College of Kuwait (ACK) is a private higher education institution, established in 2004 to teach Business and Engineering at Diploma and Bachelor Degree levels and Aircraft Maintenance at Diploma level. It has a student enrollment of 3100 with an annual budget of $46 million. 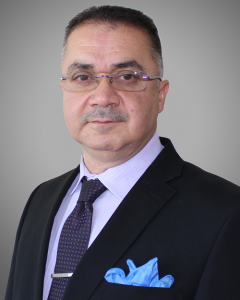 Professor (2007-2013), Associate Professor (1999-2006), and Assistant Professor (1993-1998) Civil Engineering, College of Engineering and Petroleum Kuwait University, Kuwait. Responsibilities included teaching, research, delivery of short courses, and consultation work. The latter mainly deals with the investigation, study, and design of repair for deteriorated structures in Kuwait. 2002 – 2014: Member, The Accreditation Committee at the Private Universities Council (PUC), Kuwait. Responsibilities included developing quality assurance systems, evaluation of periodical reports related to accreditation, and institutional accreditation of the private higher education institutions in Kuwait. The role of the committee involved developing specifications for the establishment of campus facilities of new higher education institutions, regular inspection and evaluation of existing campuses, and provision of technical advice on related matters to the PUC Council. 2011 – 2013: Chairman Committee for the Allocation of Lands to Educational Projects of Private Higher Education Institutions, Kuwait. The committee provided technical, engineering, and development advice to the Ministry of Higher Education on land allocation to new education projects for private higher institution along the guidelines of the National Development Plans in existing and emerging cities in Kuwait. A major project undertaken by this committee was the study of a master plan for the first technology and business park dedicated to research projects with commercial prospects by private higher educational institutions. 2011 – 2013: Chairman Real Estate Appraisal Technical Committee Global Center, College of Business Administration, Kuwait University. The scope of this committee involved the study of the current local business and legislative environments in the valuation of real estate and develop a curriculum of a certification model for professional practice. Members consisted of faculty from engineering and business colleges in addition to real estate industry practicing experts. This work generated interest from the Minister of Trade & Commerce, banks, and the Association of Real Estate Valuators in Kuwait. 1989 – 1992: Consultant Fire Research Station, Building Research Establishment (BRE), London, UK. Work involved reviewing and assessing available numerical models for the thermal and structural analyses under fire. Alternative design methods including those suggested in building codes were also considered. 1984 – 1986: Draftsman and Surveying Engineer Saudi Oger Services Ltd., Beirut, Lebanon. Work included engineering drafting and surveying the extent of damage inflicted by the civil war on residential buildings, schools, and other infrastructure in Lebanon. During my stewardship, the student enrollment of the college grew from 2550 to 3100 with a total staff population of 419 of which 156 are faculty members. This was attributed to the stability of the environment, the continuous curriculum improvement activities, various accreditation programs, and expansion of the infrastructure. I initiated and co-chaired a committee which consisted of subject experts from Kuwait Oil Company (KOC) and faculty from ACK engineering school. The scope of this committee included the facilitation of feedback on learning outcomes from the Oil & Gas industry, collaborative research, and internship programs. This initiative was drafted into an MOU signed between the KOC and ACK. Initiation of a Learning Outcomes Model to enhance the employment outcomes for ACK Graduates. This model is divided into core learning outcomes for each school, subject-specific outcomes, and graduate employability attributes. The employability attributes are defined using descriptors and a set of underpinning skills and abilities. The Learning Outcome Model is regularly visited for alignment with the dynamic changes of the industry requirements. Starting Focus Groups consisting of potential employers of ACK graduates to regularly revise subject-specific learning outcomes and assist in effecting sound internship programs to support ACK Schools of Engineering and Business. Leadership of the institutional accreditation by the Private Universities Council of Kuwait. Leadership of the activities to achieve unconditional program accreditation by Engineers Australia. Acquiring exclusive Mutual Recognition Agreements for engineering programs at ACK by signatories of Sydney Accord (including ABET, ECUK, IPENZ, and HKIE) through negotiations with Engineers Australia. Leadership of the steering committee for obtaining the initial accreditation for the College Business program with the US based Accreditation Council for Business Schools and Programs (ACBSP). Support of and participation in the ISO 9001-2008 and Investors in People (IIP) accreditation. Supporting the initiation of ACK Innovation and Entrepreneurship Center which instills concepts of innovation and fosters a culture of entrepreneurship among our students and the wider community. Leading an institution driven applied research process with strong connection to industry. I prepared the Research Strategy Plan and established the ACK Research Center with strong focus themes aligned with national priorities. I worked jointly with the research center senior manager on establishing the various components of the research system. Initiating collaboration in research with international partner institutions in Australia and Canada. Organizing a series of symposia (Symposia for Private Higher Education, Road to Excellence – SPHERE) that focus on promoting excellence in private education in Kuwait. Leading the development of a Strategic Plan for the College to provide direction and focus for activities over the next five years. Launching a series of seminars presented by national and international speakers on issues pertaining to ACK offerings and national interests, in collaboration with the ACK industry advisory board. This was also complemented by a workshop series led by industry members aimed at improving the employability skills of graduates. 2014 Award for completing twenty years at the Civil Engineering Department at Kuwait University. 2014: Award for Leading the ABET accreditation process for the Civil Engineering Department at Kuwait University. 2011 to 2014: Awards for leading committees for assessment of graduate engineering projects, Kuwait Foundation for the Advancement of Sciences and Kuwait University. 2001: Award for Participating in Guidance and Counselling Office, Kuwait University. 1990: Bursary from Imperial College in return to carrying further studies related to my PhD. 1988: Scholarship for PhD Degree, Imperial College, London..
1987: Scholarship for Master Degree, UMIST, Manchester. A Framework for Implementing Six Sigma Methodology to Accredit University Campus Facilities in Kuwait. Majid Aldaihani, Adel Alhussainan, and Mohamad Terro. The International Journal of Productivity and Quality Management (IJPQM), vol. 20, No. 2, 2017. Utilization of Six Sigma in Quality Improvement of Recycled Aggregates Concrete. Mohamad Terro, Moetaz El-Hawary, Rana Al-Fares, and Mark Goldstein. Journal of Waste Management, volume 2013, Article ID 394912, 10 pages. October 2013. Wave-Induced Forces in Offshore Structures Using Linear and Nonlinear Forms of Morison’s Equations, M. Terro, Mohamad Abdel-Rohman, Journal of Vibration and Control, Volume 13 No. 2, pp.139-157. February 2007. Observer-Based Control of Variable Dynamic Structures, M. Terro, E.K. Boukas, and M.F. Hassan, Journal of Vibration and Control, Volume 12 No.3. pp. 233-255. March 2006..
Properties of Concrete made with Recycled Crushed Glass at Elevated Temperatures, Mohamad J. Terro, Building and Environment, vol 41 issue 5, pp 633-639. May 2006. Control of Suspension Bridge Nonlinear Vibrations Due to Moving Loads, N.B. Almutairi, M.F. Hassan, M. Abdel-Rohman and M.J. Terro, Engineering Mechanics, ASCE, Vol. 132, No. 6, June 2006. Nonlinear and robust control schemes for offshore steel jacket platforms. Zribi, M., Almutairi, N., Abdel-Rohman, M., & Terro, M. Nonlinear Dynamics, 35(1), 61-80, 2004. Prediction of fire resistance of concrete filled tubular steel columns using neural networks. Al-Khaleefi, A. M., Terro, M. J., Alex, A. P., & Wang, Y. Fire Safety Journal, 37(4), 339-352, 2002. Out-of-plane behavior of surface-reinforced masonry walls. Hamoush, S., McGinley, M., Mlakar, P., & Terro, M. J. Construction and Building Materials, 16(6), 341-351, 2002. Critical Review of Fire-Dedicated Thermal and Structural Computer Programs Theory & Practice, P.J.E. Sullivan, M.J. Terro and W.A. Morris (a Reprint). Computer Applications in Fire Protection Engineering (Volume III). Edited by Paul R. DeCicco. Applied Fire Science in Transition Series, published by Baywood Inc. 2001. (Originally submitted as a report to the Fire Research Station in March 1991 and printed in J. Applied Fire Science, Vol. 3(2) 113-135, 1994). Multi-Loop Feedback Control of Offshore Steel Jacket Platforms, Mohamad J. Terro, Magdi S. Mahmoud and Mohamed Abdel-Rohman, Computers and Structures, v. 70 no. 2, pp 185-202. January 1999. An LMI Approach to H∞-Control of Time-Delay Systems for the Benchmark Problem, Magdi S. Mahmoud, Mohamad J. Terro and Mohamed Abdel-Rohman, Earthquake Engineering and Structural Dynamics. V.27 no. 9, pp 957-976. Sep. 1998. Numerical Modeling of the Behavior of Concrete Structures in Fire, Terro M.J., ACI Structural Journal. Vol. 95, No.1. pp. 173-183. March-April 1998..